Traditional Moon Planting is an ancient agricultural practice that has been used by farmers for several thousand years and is still practiced today. It is based on the synodic period of the Moon from one New Moon to the next, an average period of 29.5 days. Over time, farmers observed that all aspects of farming were affected by the interaction of the gravitational forces between the Sun, the Moon and Earth. These are the same gravitational forces that affect ocean tides around the world. Because the Moon is closer to Earth, its effects are more noticeable. These observations were handed down to younger generations as their community’s survival depended on getting the best results from their crops. Scientists have more recently confirmed that variations in sap flow, biological functions in plants, and subtle changes in Earth’s electro-magnetic fields, correspond to the Moon’s gravitational pull. Scientists have also confirmed that the Moon has an influence on breeding and feeding cycles of many life forms on this planet. As plants contain a high proportion of water, it is not surprising that they would also respond to a force that can move huge bodies of water. And, when you consider that plants absorb nutrients as ions that carry either a positive or negative electric charge, you can see how changes in electro-magnetic fields can affect the growth of plants. Each lunation cycle the Moon passes through four phases – New Moon, First Quarter, Full Moon and Last Quarter. The number of days between each change of phase can vary from 6 3/4 to 8, so to make it easier for you, the current moon phase and its duration can be found by clicking on the ‘Current moon phase’ icon in the menu bar. During New Moon and First Quarter phases, the Moon is increasing in light. In these two phases, sap flow increases in the above ground parts of plants, and these are the most suitable phases for sowing and transplanting annuals (and biennials). Flowering annuals, grains, melons and spring onions do well if planted in either phase but, generally, New Moon phase is best for leafy annuals and First Quarter is best for fruiting annuals. Liquid fertilisers will take effect more quickly if applied during the waxing phases. Shrubs and trees can be pruned in First Quarter phase when you want to produce new growth quickly, such as pruning spring-flowering shrubs or summer pruning of roses. When pruned while sap flow is high, sap is quickly diverted to the lateral shoots. When sap flow is low, regrowth is slower and dieback is more likely to occur in some plants. First Quarter phase is also good for grafting and budding because these require a high sap flow for successful results. During the Full Moon and Last Quarter phases the Moon decreases in light and sap flow in plants is more concentrated in the root area. As sap flow gradually slows during these two phases, Full Moon phase is best for sowing and planting because germination is lower, and regrowth slower, during Last Quarter phase. Because sap flow is lower in the foliage part of plants, crops or seed harvested for storage or drying are less likely to rot if harvested during the Moon’s waning period. Full Moon phase is best for the sowing and planting of both root crops and perennials (plants that live longer than two years). All trees, shrubs, vines (including fruit trees and vines), globe artichokes, asparagus, rhubarb, strawberries, herbaceous perennials, bulbs and lawn grasses are perennials. The reason that these plants are planted (or sown) in the root vegetable phase is that perennials have a different type of root system from leafy and flowering annuals. Roots of perennial plants have, like root vegetables, the ability to store carbohydrates and nutrients, and this type of root system is important for the longevity of perennials. Because Full Moon phase favours root growth, this is also an excellent phase for taking cuttings, or for aerial layering, because root growth must form to support new foliage growth. This is also the best phase for dividing plants for the same reason. Prune dormant plants during Full Moon phase. Last Quarter phase is best for cutting back rampant shrubs and vines, – regrowth will be less vigorous. Traditional moon planting uses the tropical zodiac that divides the celestial belt into twelve equal parts of 30 degrees, named after the constellations that were closest to them in the second century B.C., and ignores that fact that the actual constellations vary widely in size. The twelve segments were also given labels of ‘positive’ or ‘negative’. The equal divisions were basically markers for degrees of tension from the major permanent points of reference (the Solstices and the Equinoxes), which occur within 24 hours of the same days each year. Negative segments are considered ‘fertile’ and the best days within a phase for sowing, planting, taking cuttings, budding and pruning to encourage growth. Positive segments are considered ‘barren’ and best days within a phase for collecting seeds, harvesting crops and for storage and weeding. Does traditional moon planting work? As someone who has obtained certificates in both astrology and horticulture and had been working in horticulture for some 40 years, I felt competent to test and assess the various moon planting and gardening guides available to the public. Over a period of eight years, I experimented with and compared different forms of moon planting against detailed records of sowing, germination, growth, harvesting and pruning. Some moon or lunar calendars and guides advised readers to plant all plants that produce fruit above ground during First Quarter phase. This ignores the different root system of perennials. Other guides totally ignored moon phases and focused on the astrological signs. The tray below on the left was sown during Full Moon phase, which is an incorrect moon sowing phase for leafy annuals. 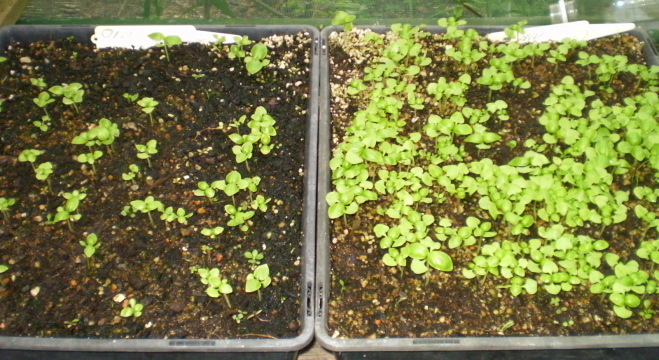 The tray on the right was sown two weeks later during New Moon phase. Both were sown in the same seedling mix and received the same amount of care. I found that most moon planting guides in women’s magazines are prepared by astrologers who have used the astrological ‘rulership’ of plants rather than moon planting methods that have been handed down through the centuries. These interpretations have produced some results that make no horticultural sense and must be confusing for readers. The designation, by traditional moon planting farmers, of fertile and barren ‘signs’ varies slightly from the fertile/negative and barren/positive labels applied in astrology, and I feel there had to be a reason for this variation to remain constant through the centuries. Although there has been no scientific study into this part of moon planting, I believe it relates to the changes in the Earth’s electro-magnetic field and the absorption of plant nutrients, which must be absorbed as water-soluble electrically-charged ions. Some moon or lunar planting guides will tell you to avoid watering your garden on ‘fertile’ days while others will advise to avoid watering on ‘barren’ days. A perusal of rainfall records will show that Nature doesn’t follow these rules. Gardens should be watered when they need it. After comparing the various methods of Moon Planting, I came to the conclusion that the traditional moon planting method, although the simplest to follow, made the most horticultural sense, and it works best for us. The basic rules, or principles, are described below. 1. Avoid sowing, planting or taking cuttings from 12 hours before to 12 hours after the exact change of moon phase. The twelve hours immediately before and after the exact change of each phase is not a good time for sowing, planting, or taking cuttings. We have found that the increase or decrease of unfavourable energy is gradual and it will not have an obvious effect if you run an hour or so into this period when you have a lot of sowing or planting to do. While this is not a good period for sowing or planting, this time can be used to prepare beds or compost heaps, apply mulch, etc. 2. NEW MOON PHASE – the best time to sow or transplant leafy annuals (we eat the leaf or stem), and flowering annuals. Also sow annual grasses, green manures, and apply liquid fertilisers. Mow lawns to encourage growth. This is the second best phase to sow or transplant fruiting annuals. 3. FIRST QUARTER PHASE – the best time to sow or transplant fruiting and flowering annuals (we eat the fruit or seed bearing part), and grains. Also sow annual grasses, green manures, and apply liquid fertilisers. Prune to encourage growth and deadhead roses and flowering annuals. Carry out grafting and budding. Mow lawns to encourage growth. This is the second best phase to sow or transplant leafy annuals (we eat the leaf or stem). 4. FULL MOON PHASE – the best time to sow or plant out root crops and all fruiting and decorative perennials, including fruit trees. Also sow lawns or lay turf, harvest for storage, take cuttings, divide plants, prune dormant plants and apply solid fertilisers. Mow lawns to slow growth. 5. LAST QUARTER PHASE – no sowing or planting during this phase. This is a good phase for attending to your soil; weeding, applying mulch, making compost, preparing manure teas, applying solid fertilisers and digging or ploughing, if necessary. Prune to restrain growth, and mow lawns to slow growth during this phase. 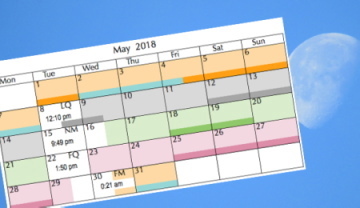 A current, colour-coded, easy-to follow traditional moon planting calendar is available for purchase here. This entry was posted in Moon planting explained and tagged Aussie gardening, Australian gardening, barren signs, cuttings, easy gardening, easy organic gardening, environmentally friendly gardening, fertile signs, first quarter moon, flowers, fruit, full moon, growing plants, how to grow, last quarter, lunar cycle, lunar month, lunar planting, manure, manure tea, moon phases, Moon Planting diary, moon planting guide, moon signs, new moon, organic fertilisers, organic gardening, planting by the moon, plants, synodic period, when to grow. Bookmark the permalink. Pingback: Green-Change.com » Blog Archive » What Is Lunar Planting? Great site and book. Very helpful. I check in regularly. Thankyou for sharing your knowledge. Hi by the looks of this you are basing your calculations on the synodic month rather than the sidereal month which changes the times and dates that the moon is influenced by that constellation usually by approx 2 days. Thanks for the post and especially the up to date current phase and timings on the side panel. I’m trying moon planting out for the first time and finding it a great help with succession planting and getting a bit more organised in the garden. I am loving the detail in your article in Organic Gardening mag that is taking my moon phase gardening to a new challenge. If I am now to plant with seedlings is there a better time to pot them? hi there, i am a recent new comer to biodynamic gardening. i am looking for more information on planting trees according to their planetary counterparts. can you direct me to a useful publication? thanks! If you had read my book you would know that the time of year or the weather is more important for treating plant diseases than particular moon phases as natural fungicides work by changing the pH of the leaf surface so the fungi can’t survive and the treatment is wasted if rain is imminent. Pest and disease attack are merely signs that cultivation practices need improving. Black spot is more common where roses have poor air circulation or foliage is wet late in the day. An application of seaweed extract tea at weak black tea strength is beneficial as trace elements in seaweed strengthen plants’ immune system. If applying this as a foliage spray when plants are in leaf, it is best to apply it during First Quarter phase when sap flow is higher for faster absorption. Leaf curl in stone fruit is more common in undernourished trees. Lack of copper and other trace elements contribute to susceptibility to this disease. It must be treated before bud burst when the fungus is transferred to the new leaves – late winter for most trees and early winter for almonds. Apply seaweed extract tea and a complete organic fertiliser to the soil at the base of trees during winter to prevent future problems.